Jack, a 10-year old boy, is riding his bicycle on the way home. Suddenly, a dog ran in front of his path, causing him to swerve towards the canal. Jack fell through the canal and his bicycle landed on top of him. The emergency room physician took his x-ray and later on informed Jack’s parents that their son had a closed fractured on his right arm. Injury to one part of the musculoskeletal system results in malfunction of adjacent muscles, joints, and tendons. A fracture is a complete or incomplete disruption in the continuity of the bone structure and is defined according to its type and extent. Fractures occur when the bone is subjected to stress greater than it can absorb. When the bone is broken, adjacent structures are affected, resulting in soft tissue edema, hemorrhage into muscles and joints, joint dislocations, ruptured tendons, severed nerves and damaged blood vessels. Complete fracture. A complete fracture involves a break across the entire cross-section of the bone and is frequently displaced. Incomplete fracture. An incomplete fracture involves a break through only part of the cross section of the bone. Comminuted fracture. A comminuted fracture is one that produces several bone fragments. Closed fracture. A closed fracture is one that does not cause a break in the skin. Open fracture. An open fracture is one in which the skin or mucous membrane wound extends to the fractured bone. Direct blows. Being hit directly by a great force could cause fracture in the bones. Crushing forces. Forces that come into contact with the bones and crush them could also result in fractures. Sudden twisting motions. Twisting the joints in a sudden motion leads to fractures. Extreme muscle contractions. When the muscles have reached its limit in contraction, it could lead to serious fractures. The pain is continuous and increases in severity until the bone fragments are immobilized. Loss of function. After a fracture, the extremity cannot function properly because normal function of the muscles depends on the integrity of the bones to which they are attached. Displacement, angulation, or rotation of the fragments in a fracture of the arm or leg causes a deformity that is detectable when the limb is compared with the uninjured extremity. There is actual shortening of the extremity because of the compression of the fractured bone. When the extremity is gently palpated, a crumbling sensation, called crepitus, can be felt. Localized edema and ecchymosis. Localized edema and ecchymosis occur after a fracture as a result of trauma and bleeding into the tissues. 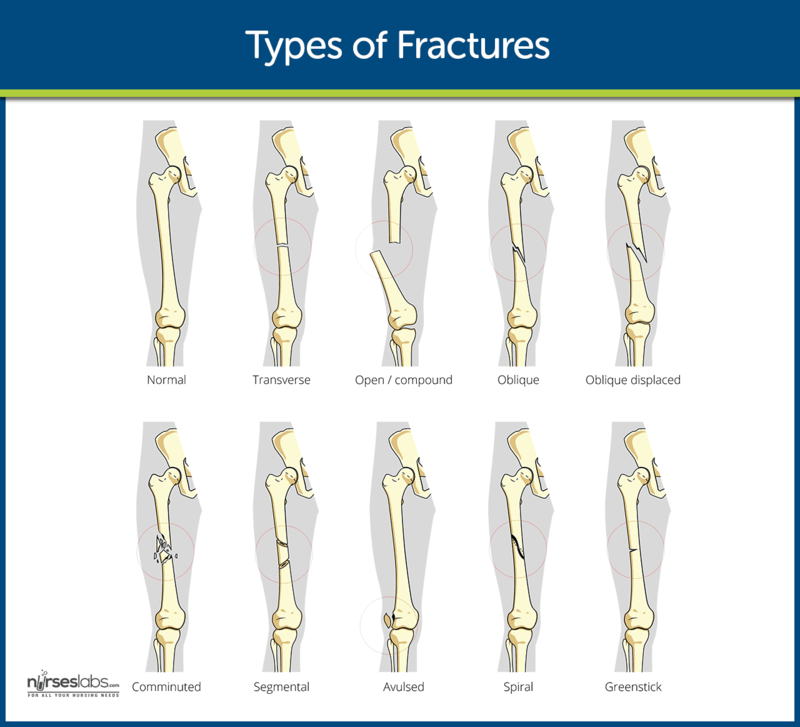 Complications of fractures may either be acute or chronic. Hypovolemic shock resulting from hemorrhage is more frequently noted in trauma patients with pelvic fractures and in patients with displaced or open femoral fractures. Fat embolism syndrome. After fracture of long bones and or pelvic bones, or crush injuries, fat emboli may develop. Compartment syndrome. Compartment syndrome in an extremity is a limb-threatening condition that occurs when perfusion pressure falls below tissue pressure within a closed anatomic compartment. To determine the presence of fracture, the following diagnostic tools are used. X-ray examinations: Determines location and extent of fractures/trauma, may reveal preexisting and yet undiagnosed fracture(s). Bone scans, tomograms, computed tomography (CT)/magnetic resonance imaging (MRI) scans: Visualizes fractures, bleeding, and soft-tissue damage; differentiates between stress/trauma fractures and bone neoplasms. Arteriograms: May be done when occult vascular damage is suspected. Complete blood count (CBC): Hematocrit (Hct) may be increased (hemoconcentration) or decreased (signifying hemorrhage at the fracture site or at distant organs in multiple trauma). Increased white blood cell (WBC) count is a normal stress response after trauma. Urine creatinine (Cr) clearance: Muscle trauma increases load of Cr for renal clearance. Coagulation profile: Alterations may occur because of blood loss, multiple transfusions, or liver injury. Management of a patient with fracture can belong to either emergent or post-emergent. Immediately after injury, if a fracture is suspected, it is important to immobilize the body part before the patient is moved. Adequate splinting is essential to prevent movement of fracture fragments. In an open fracture, the wound should be covered with sterile dressing to prevent contamination of the deeper tissues. Fracture reduction refers to restoration of the fracture fragments to anatomic alignment and positioning and can be open or closed depending on the type of fracture. 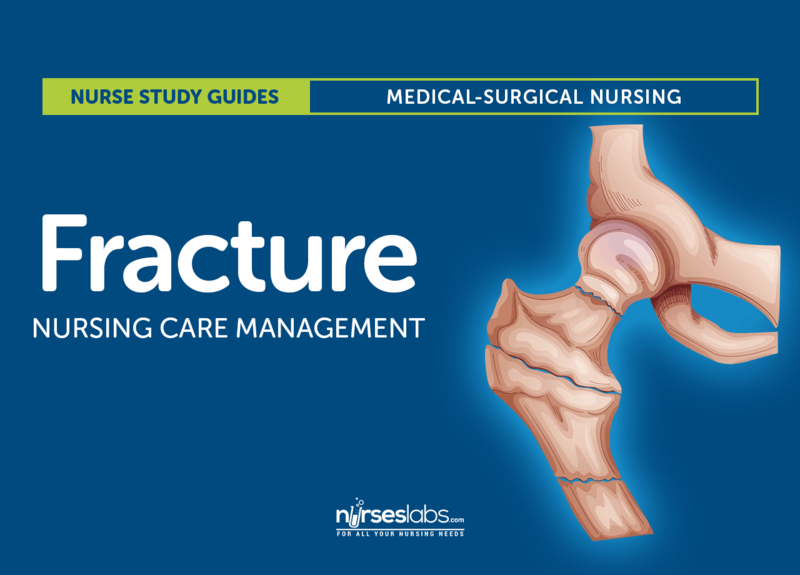 Nursing management for close and open fractures should be differentiated. Close fracture. The patient with close fracture is assessed for absence of opening in the skin at the fracture site. Open fracture. The patient with open fracture is assessed for risk for osteomyelitis, tetanus, and gas gangrene. The fractured site is assessed for signs and symptoms of infection. Acute pain related to fracture, soft tissue injury, and muscle spasm. Impaired physical mobility related to fracture. Risk for infection related to opening in the skin in an open fracture. Achieve a pain-free, functional, and stable body part. Maintain vital signs within normal range. Exhibit no evidence of complications. The nurse should instruct the patient regarding proper methods to control edema and pain. It is important to teach exercises to maintain the health of the unaffected muscles and to increase the strength of muscles needed for transferring and for using assistive devices. Plans are made to help the patients modify the home environment to promote safety such as removing any obstruction in the walking paths around the house. Wound management. Wound irrigation and debridement are initiated as soon as possible. Elevate extremity. The affected extremity is elevated to minimize edema. Signs of infection. The patient must be assessed for presence of signs and symptoms of infection. The following should be evaluated for a successful implementation of the care plan. Achieved a pain-free, functional, and stable body part. Maintained vital signs within normal range. Exhibited no evidence of complications. Control swelling and pain. Describe approaches to reduce swelling and pain such as elevating the extremity and taking analgesics as prescribed. Care of the affected area. Describe management of immobilization devices or care of the incision. Consume diet to promote bone healing. Mobility aids. Demonstrate use of mobility aids and assistive devices safely. Avoid excessive use of injured extremity and observe weight-bearing limits. Client’s description of response to pain and acceptable level of pain. Ability to participate in specific or desired activities. B: Diagonal fracture is not a type of fracture. A: Open fracture is one of the types of fractures. C: Closed fracture is one of the types of fractures. D: Comminuted fracture is one of the types of fractures. C: X-ray is the most definitive diagnostic tool in assessing for fracture as it allows visualization of the affected part. A: Blood studies are not used in a patient with fracture. B: SGPT and SGOT tests are not used in patient with fracture. D: MRI may be used but it is not the most definitive tool in assessing fractures. Which of the following is a nursing diagnosis for a patient with fracture? C: Acute pain is the most appropriate nursing diagnosis for a patient with fracture. A: Risk for electrolyte imbalance is not a nursing diagnosis for a patient with fracture. B: Situational low self-esteem is not a nursing diagnosis for a patient with fracture. D: Impaired breathing pattern is not a nursing diagnosis for a patient with fracture. The fractured part should be elevated above the level of what organ? B: The fractured area should be elevated above the level of the heart to promote venous return. A: The fractured area should not be elevated above the level of the brain. C: The fractured area should not be elevated above the level of the liver. D: The fractured area should not be elevated above the level of the kidney. What kind of shock is most commonly found in a patient with fracture? A: Hypovolemic shock resulting from hemorrhage is more frequently noted in trauma patients with pelvic fractures and in patients with displaced or open femoral fractures. B: Cardiogenic shock is not frequently found in patients with fracture. C: Neurologic shock is not frequently found in patients with fracture. D: Septic shock is not frequently found in patients with fracture. B. SGPT and SGOT tests. 3. Which of the following is a nursing diagnosis for a patient with fracture? A. Risk for electrolyte imbalance. 4. The fractured part should be elevated above the level of what organ? 5. What kind of shock is most commonly found in a patient with fracture? 1. Answer: B. Diagonal fracture. B: Diagonal fracture is not a type of fracture. A: Open fracture is one of the types of fractures. C: Closed fracture is one of the types of fractures. D: Comminuted fracture is one of the types of fractures. C: X-ray is the most definitive diagnostic tool in assessing for fracture as it allows visualization of the affected part. A: Blood studies are not used in a patient with fracture. B: SGPT and SGOT tests are not used in patient with fracture. D: MRI may be used but it is not the most definitive tool in assessing fractures. 3. Answer: C. Acute pain. C: Acute pain is the most appropriate nursing diagnosis for a patient with fracture. A: Risk for electrolyte imbalance is not a nursing diagnosis for a patient with fracture. B: Situational low self-esteem is not a nursing diagnosis for a patient with fracture. D: Impaired breathing pattern is not a nursing diagnosis for a patient with fracture. B: The fractured area should be elevated above the level of the heart to promote venous return. A: The fractured area should not be elevated above the level of the brain. C: The fractured area should not be elevated above the level of the liver. D: The fractured area should not be elevated above the level of the kidney. 5. Answer: A. Hypovolemic shock. A: Hypovolemic shock resulting from hemorrhage is more frequently noted in trauma patients with pelvic fractures and in patients with displaced or open femoral fractures. B: Cardiogenic shock is not frequently found in patients with fracture. C: Neurologic shock is not frequently found in patients with fracture. D: Septic shock is not frequently found in patients with fracture.